Early on a Monday evening and encouragingly busy. A proper boozer that is well worth a visit. Early afternoon and busy. A wonderful pub and a good friendly atmosphere in here today. Eagle (was Wells & Young's, was Charles Wells, was Wells) - Young's Bitter 3.70 Very good, we came to the opinion that Marston's are doing a pretty good job with Young's beers. Evening visit, I really like this traditional unspoilt pub. Eagle (was Wells & Young's, was Charles Wells, was Wells) - Young's Bitter 3.70 Good Young's. About 6pm and the second pub on a tour of Wandsworth, this pub remains one of my favourites. A busy pub today. I enjoyed a beef and horseradish sandwich with my pint. Early afternoon and busy although it would have to be extremely busy to fill this place. Good friendly service. I came here with a friend who wanted to see where one of her ancestors faced court proceedings for lunacy in the 19th Century, we were told that what is now a display case was once a door that led to the court room, and given a bit of interesting history of the pub. 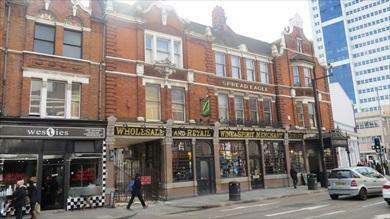 The pub is found in Wandsworth, Greater London, SW18 2PT. Large late Victorian pub with an iron canopy over the entrance, and lots of etched glass inside, there has been a pub on this site since at least the fifteenth century with mention being made of this pub in the year 1664. It was originally much larger than at present with frontages in both Wandsworth High Street and Garratt Lane, with a ballroom that was also used as the County Court. We have visited this pub 8 times, seen 3 different beers and tried 1 of them.